It was his gesture after the match that was termed ‘cute’. The eighth edition of the Big Bash League (BBL) is in full flow. There is never a dull moment and it never fails to impress the fans. 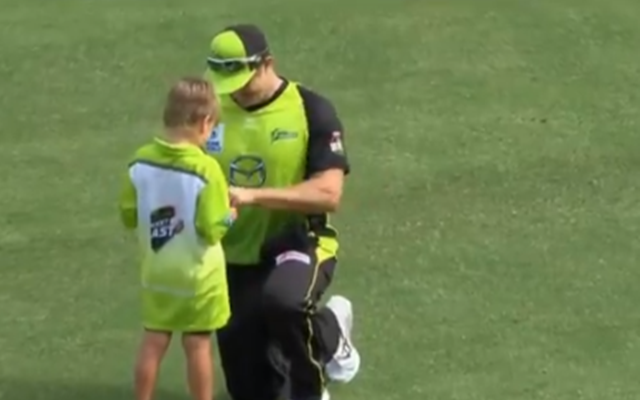 There are a lot of moments on the cricket field that melt a fan’s heart. Shane Watson who is leading the Sydney Thunder was a part of one such moment in the game against Adelaide Strikers. His 40-ball 68 set the tone for Thunder’s fourth win of the season. Watson struck four fours and five sixes as he won the man of the match award for his excellent knock. However, it was his gesture before the match that was termed ‘cute’ and touched the heart of the fans. The former Australian all-rounder walked up to his son and gave him an autograph. Shane Watson signed his son’s cap and then gave another autograph on his shirt before giving him a big hug and posing for the cameras. The junior Watson was ecstatic and was all smiles when his father showed this great gesture. Former Pakistan wicket-keeper Kamran Akmal was delighted to see this moment and termed it a ‘sweet’ and ‘the best moment’. Sydney Thunder have had a stop-start season in this edition. After getting off to a good start by winning the first couple of games, they lost a couple on the bounce. However, they won a nail-biting encounter against Perth Scorchers (by 1 run) before losing another couple of games on the trot. Thus, Thunder will be pleased to get back on track as they completely outplayed the defending champions Adelaide Strikers. Watson’s 68 helped them to post 168 batting first. A collective effort from the bowlers helped them defend the target easily and they eventually won by a huge margin of 71 runs. This win propelled the Thunder to 8 points. Three other teams have 8 points but with a better net run-rate, the Thunder are placed second on the points table.